← The Walking Dead: TV series – OMG a decent comic book adaptation! 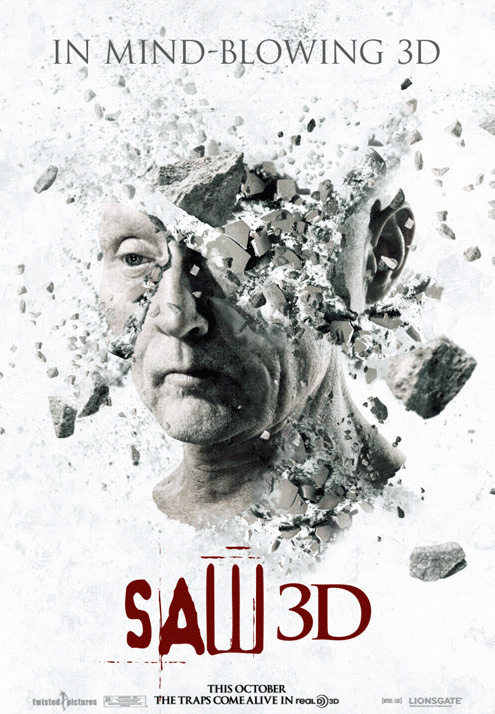 Saw VII (I refuse to acknowledge this 3D nonsense) is (allegedly!) the last in the Saw series. Jigsaw (John) is long gone, he died a couple of movies ago, but his legacy has lived on in former (?) cop, Hoffman. But Jigsaw’s wife (Jill) knows more than she’s letting on and Hoffman needs to be rid of her. In Saw VII, Hoffman is out to take Jill out. But this is the last Saw movie, so what will happen to Hoffman? This is a spoiler free review, so you’ll have to watch the movie to find out. There are more traps in Saw VII than in any other Saw film, more gore too if I’m not mistaken. One particular (car) trap springs to mind. A man is glued (literally!) to the drivers seat, the car is up on jacks and under the rear wheel is a womans head, she’s strapped to the floor. Behind the car is a second man, he’s all strapped up too. And, last but not least, in front of the car is another man. I shant tell you the outcome, but oh, there will be gore. 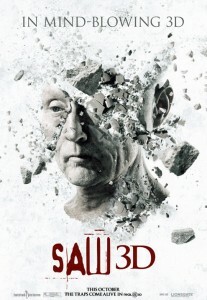 If, like me, you’ve been a slave to the Saw story then you’ll know what the expected outcome of Saw VII will be, considering that Dr. Gordon makes a rare appearance. No, he’s not been behind it all! I’d hoped they’d pull a rabbit out of the hat and have a more unexpected ending, but at least it confirms/denies much of the speculation that’s been ongoing now for several years, but it’s good to bring it all to an end. There was a lot of blood, plenty of scenes to make you winch, and a ton of gore, so I’d say it’s gone out with a bang. So… when’s that prequel getting made? This entry was posted in Gore, Horror and tagged amanda, doctor, dr, envelope, gordon, hoffman, jigsaw, jill, John, kramer, saw, tape, tuck. Bookmark the permalink.